It seems like so many of my friends are having baby boys these days. I love making baby quilts, but I really struggle with fabrics and patterns for boys. So many designs and prints seem just a little bit girly. I thought I would share a few I have made and hopefully you guys have some great ideas because it would be useful to have a list of possibilities for the future. Some of these were made way back when I started quilting. I have discovered that I am much more likely to make a quilt for a friend who is having a girl, but that doesn't seem very fair. So I was wondering . 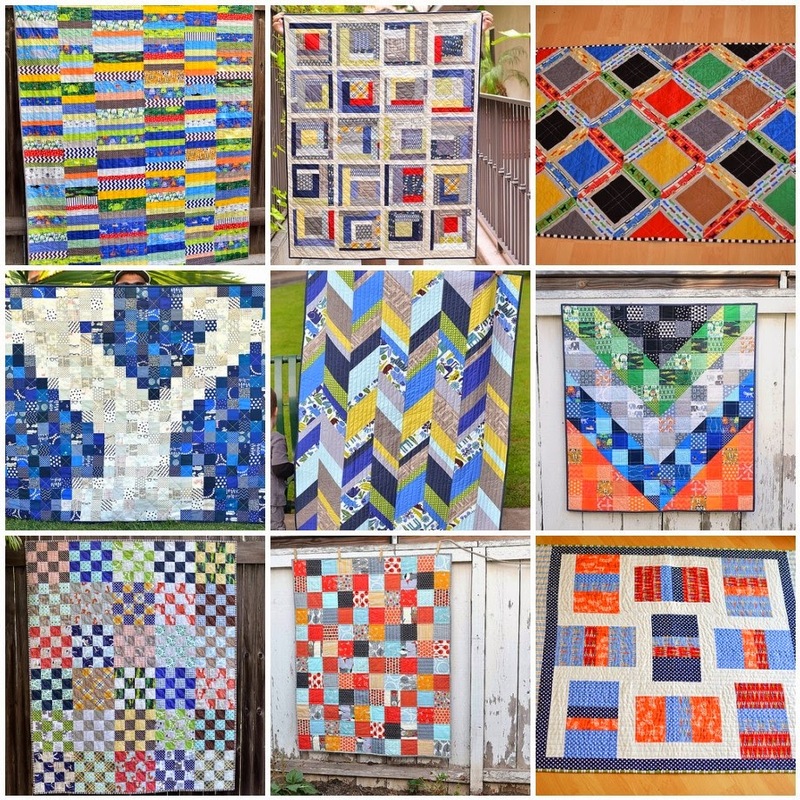 . . do you have a favorite pattern for baby boy quilts? I think I have pinned most of those quilts as ideas on my pinterest board. I just finished a baby boy quilt and have two more to make. Thanks. These are all amazing quilt and the recipients are very blessed to have a dear friend to make them such a special gift. My current favorite pattern is Elizabeth Hartman's Fancy Fox quilt. Its pre-cut friendly, goes together quick,and looks super cute in any fabric. I'm making a quilt right now for a friend who has decided that they won't find out if the baby is a boy or a girl before it's born. So I'm using a large forest print for the main part of the blocks (fussy cut) with two shades of brown for the outside of the box and the sashing, with white boxes in the corner of the blocks and the middle of the sashing, so that the white boxes make a little 9-patch. I'm trying to work on embroidering some forest animals. The back is a light brown and the binding is blue, but more of a bright / sky blue, not baby blue. I just yesterday posted a top using the "Line Dance" pattern from Moda Bake Shop. The one I made could be definitely be for a boy, and this pattern would be easy to make very boyish. These are all awesome! I made one for my son, using my own block pattern. It's a twin, but the block could easily be used for a baby quilt too: http://needleandnest.blogspot.com/2013/10/master-ws-quilt-aka-traffic-cone-quilt.html - it's one of my all-time favorite quilts. Agreed, boy quilts are difficult! Fabrics and patterns. I just found the Dapper pattern from Simply Retro that I plan to make. Also the Pow Wow pattern from Cluck Cluck Sew is another good boy quilt. I quilt mainly for charity and feel that I am led to make quilts for boys. Finding patterns and fabrics that are more boyish is hard. Thanks for showing your ideas. I really like wonky log cabins with with maybe a masculine center. Thanks. PS on pinterest i saw a airplane quilt that could be used for a boy. My favorite baby boy quilt I ever made was a string quilt. I used white for the center string. How about a quilt with sailboats? I have made one with HSTS for the sails and a half-hexagon for the boat. There are many cute patterns to be found on line. For boys I really like the pinwheel quilt from Leslie Unfinished. This is my favorite pinwheel top! Also there are several boy-friendly quilts in "Growing Up Modern" by Allison Harris. This is a great book for kid quilts. I have made the #1 pattern over and over with all kinds of prints including, veggies, jungle, cowboy and just scraps. I'm addicted to the easy process. Everything looks good together, even "uglies". You are right about hard to find fabric for boys, but your quilt works!